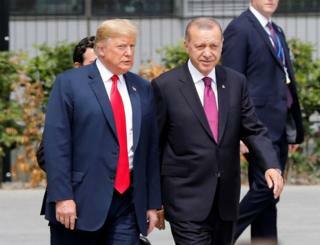 Diplomatic relations between the US and Turkey have declined since the failed 2016 Turkish coup. Earlier this month, the Trump White House hit Turkey’s justice and interior ministers with sanctions over the country’s ongoing detention of an American pastor. The US has also been refusing to extradite Fethullah Gulen, a cleric and former Erdogan ally who has been living in the US state of Pennsylvania, and that Turkey accuses of leading the attempted “Gulenist” coup. Turkish politicians are also furious at American military support for Kurdish militia fighting the so-called Islamic State in northern Syria.